Mariana Ferencakova has been a chiropractor since 2004. 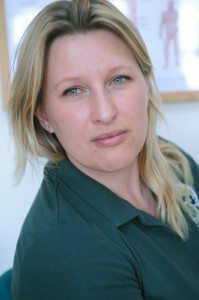 Since graduating from the Anglo European College of Chiropractic, she has practised in different chiropractic clinics throughout the South of England, gaining experience in treating many problems and working with various health care professionals. Outside work, Mariana is a busy mum to two children, and in her spare time takes her boxer, Poppy for long walks keeping up her active lifestyle. “I chose this profession because I wanted a challenging and stimulating job in where I could help and inspire those with both chronic and acute problems. Mariana firmly believes in the importance of preventative care in the management of chronic conditions such as lower back and neck pain. As part of this strategy she gives her patients stretches and exercises alongside their chiropractic treatments.